Our team includes a diverse mix of engineers, marine biologists, oceanographers—and me, an anthropologist. 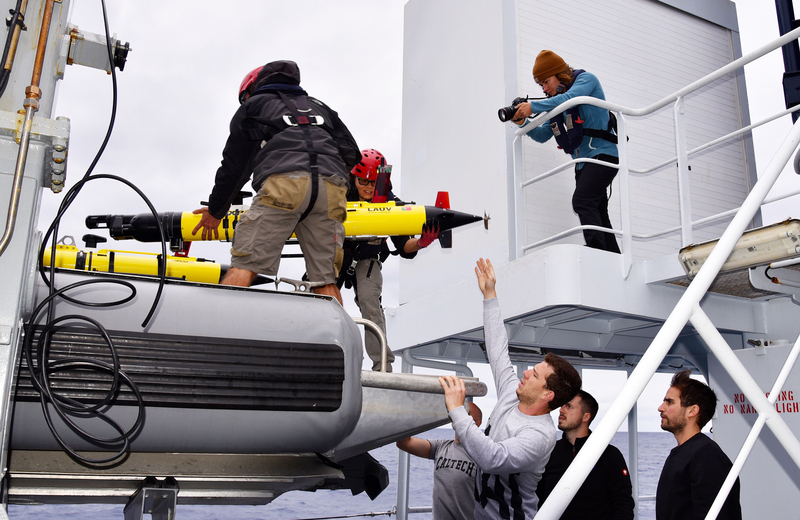 What is an anthropologist doing on the #OceanRobotsTeam? I study how people and machines work together in extreme work environments. Each day, I collect qualitative data on, for example, the ways that people and robots communicate, how different kinds of decisions are made, the social habits and technologies particular to this environment, and workgroups. While it is not something you hear about every day, what I do is part of a long tradition (over a century) of qualitative research in organizations and workplaces. Anthropology has a research method called ethnography that is used to study culture among communities. Workgroups are small communities that in work ethnography we call “communities of practice,” including all kinds of work domains, such as transportation, policing, medicine, and computer technology. 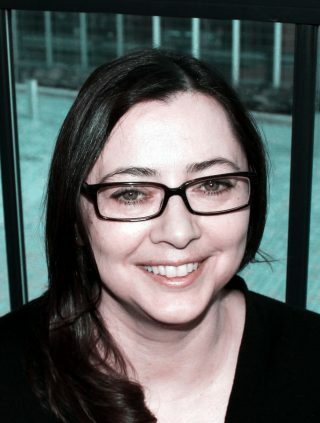 In the past 30 years, ethnographic researchers in the fields of Anthropology, Communication, Science and Technology Studies (STS), and Sociology have been studying how people work in work environments of science and exploration, including high-energy physics, space exploration, ocean science, planetary science, and artificial intelligence. During our three weeks aboard R/V Falkor, the #OceanRobotsTeam has many intense work plans. Our operations have to be carried out in conditions shaped by many dynamic factors including the weather, the ship, the crew, the vehicles, the scientists, the engineers, and the ocean. We have a heterogeneous assembly of vehicles and of experts. 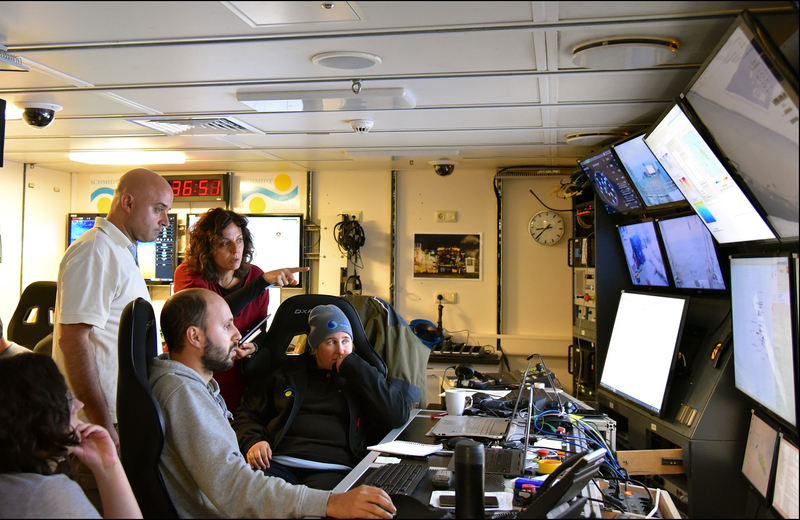 In the Science Control Room, Catarina Magalhães points out an area of high salinity to members of the Ocean Robots Team, including Chief Scientist João Borges de Sousa, marine technician Deborah Smith, João Pereira and Maria Costa. When I look at this team I see a workgroup of individuals with different professional backgrounds and experiences that shape the ways that they are accustomed to doing things like discussing ideas, engaging with instruments, planning for data collection, taking turns, and interpreting information. We are situated in a work environment that combines high-tech robotics, remote sensing, navigation, and software with centuries old seafaring practices. The team has varying relationships with these technologies. Also, the close quarters and set number of workspaces result in a lot of face-to-face interaction, which is helpful for time-sensitive decision-making and intercultural communication. 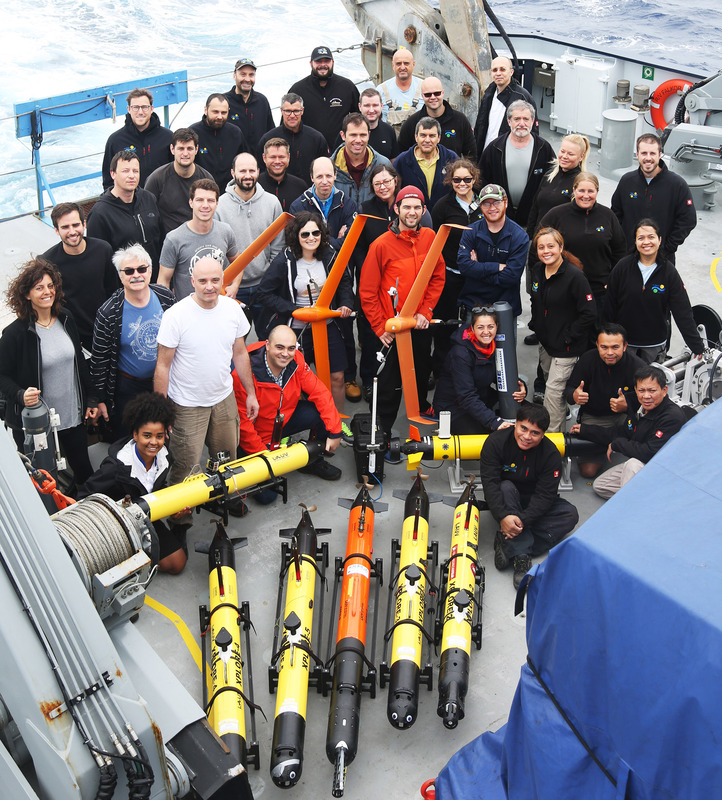 For three weeks in situ with the #OceanRobotsTeam (and from the previous year of team preparation), I examine how they do their work. In my analysis, I consider what patterns emerge and what might these patterns suggest for technologies and social processes to better support their efforts. I do not know what I will find but I am certain that paying close attention to intersecting dynamic factors will bring many things to the surface. Manuel Ribeiro reaches up to grab the LAUV as Michael Schoenherr and Citlalli Ruiz unload it from Atreyu. Meanwhile, Mary Lide Parker films the process.